"Breathe In Breathe Out" is the third collaborative performance project between Luigi Coppola and Yingmei Duan. The stage is installed with a large pulley system of ropes. The ropes connect the audience to different objects: a microphone, a book of the law, a bucket of water, a chair, a table, a knife, and some rubbish bags. These ropes also hold the artists, and the audience can interact with these ropes and pull the performers and the objects as they wish. It is almost as if they have a remote control to command the performance. One cage with a living white rabbit is free among the other tied objects. On the stage there is also a stopwatch on stage timing the performance. 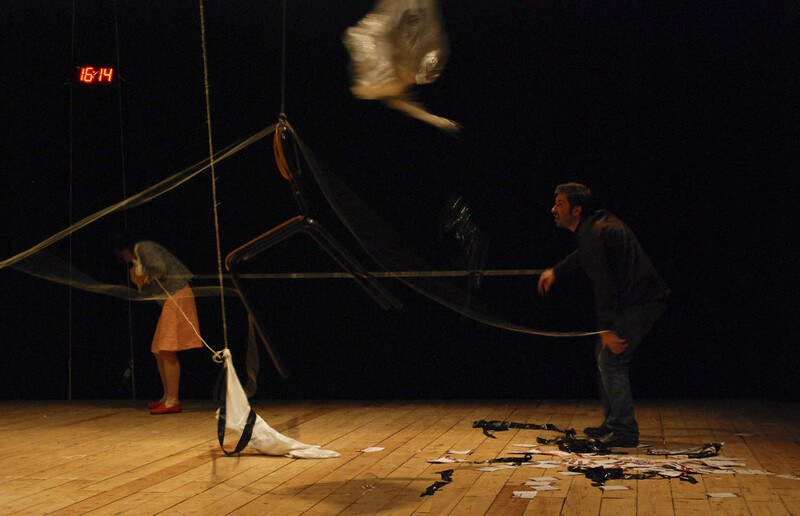 Within the pulley system/spider web the artists represent symbols of moral, social, religious constriction and denial of freedom, in which the audience has an active role and a possibility to move and transform the performance.